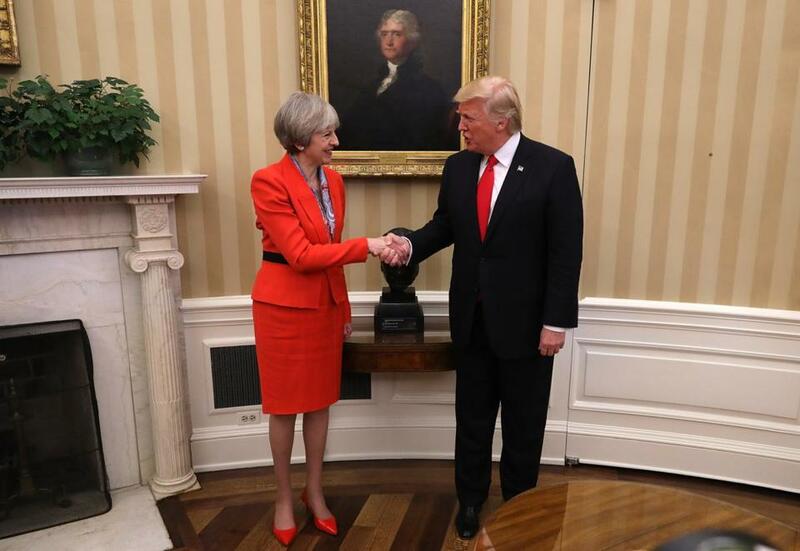 British Prime Minister Theresa May shook hands with President Trump on Friday in the Oval Office. British Prime Minister Theresa May’s just-completed visit to Philadelphia and Washington came at a critical time for both her country and the United States, and particularly for the one-week old Trump administration. Rarely in peacetime have two national leaders faced a more consequential opportunity to redirect, dramatically and swiftly, the course of international affairs. The prospects here lie at the core of the alliance structures America has created since 1945 to protect its vital global interests. Strong and lasting alliances are not merely transactional. They do not rest on accounting examinations of recent debits and credits. Instead, they rest on profoundly important shared values and interests, foundations that endure transitory political and economic bumps in the relationship. This is how the US-UK “special relationship” was built over the years since it was forged in World War II. May and Trump made it clear in their public remarks that they intend to rejuvenate the “special relationship,” in both economic and political affairs. That does not mean they will necessarily agree on everything, exemplified by their likely conflicting views on sanctions imposed on Russia for its military adventurism across international borders in Ukraine. Nonetheless, a newly independent Britain and a new Trump administration have far more uniting than dividing them. May’s government is currently undertaking the unprecedented task of unwinding itself from the cumbersome, bureaucratic and regulatory morass of the European Union. The Brexit decision, made last June 23 in a referendum, confounded trans-Atlantic business and political elites, who could not imagine that the desire for mere self-government could overcome the secular theology reflected in their conception of Europe’s “ever closer union.” May herself opposed Brexit, but now leads a government whose place in history will be determined by whether it succeeds or fails in exiting the EU on terms advantageous to Britain. In America, Trump’s victory upended decades of belief in multilateral trade deals essentially for their own sake. The new president has said he believes in free trade, insisting correctly that true free trade is not reflected in the dirigiste, “managed trade” provisions that characterize so many so-called free trade agreements. Perhaps even more importantly, Trump has said emphatically that he will follow a revolutionary principle in administering trade treaties: He will expect the other parties to adhere to their obligations, and will not conceal or ignore their violations. 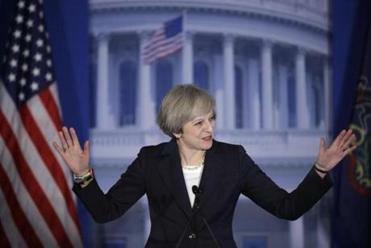 British Prime Minister Theresa May on Thursday embraced US President Donald Trump as a friend and ally. The potential for a dramatically different trade and investment agreement between America and Britain, despite obvious risks and difficulties, should be the highest and most immediate priority. Both countries can shed layers of stifling government regulations in the process, and London and New York could sustain and enhance their reputations as the financial capitals of the world, while competitors in Europe and Asia lag behind. US businesses could reach UK markets all but closed-off for decades because of high EU external barriers to trade. In short order, Canada could join this new bilateral trade relationship, with other non-EU nations in Europe coming on board in due course. Not only would the prospect of a US-UK agreement strengthen London’s hand in the exit negotiations with Brussels, it would encourage nations remaining within the EU to demand that the lords of Brussels wake up to what is happening in the wider world. Politically, with Britain freeing itself from the EU’s common foreign and defense policy, it will resume its role as a full leader of NATO. For far too long, NATO’s European members (with some notable exceptions) have simply not adequately attended to threats to international peace and security. Sustained, disciplined thinking on global threats like nuclear proliferation and international terrorism, and threats on the Continent itself from a belligerent Kremlin, has been lacking, also for far too long. As Britain once again demonstrates a broader perspective, the possibility of making NATO a global organization, as suggested by former Spanish Prime Minister Jose-Maria Aznar, can receive careful attention. Admitting Australia, Singapore, Japan and Israel, to name just a few, could contribute significantly to international stability if they thought NATO capable of resuming a vibrant existence. Especially in Europe, there is misplaced concern that Trump will work actively for the collapse of the EU. He doesn’t have to; the Europeans themselves are doing quite a job of demonstrating the EU’s manifold internal problems. The new White House should simply cease propping up the EU’s mercantilist, anti-democratic, inward-looking proclivities, and nature will take its course. And although May and Trump appear to differ on the Russia sanctions issue, this is neither new nor unusual in US-UK relations. Tony Blair was accused in Britain of being George W. Bush’s poodle during the second Iraq war, a charge that was unfair and untrue from the outset. Neither Theresa May nor Donald Trump are anyone’s poodles, and a new special relationship will be the stronger for it. John R. Bolton, a senior fellow at the American Enterprise Institute, was the US ambassador to the United Nations from August 2005 to December 2006.